Rosemary KimBal is an accomplished artist and illustrator with almost forty years of experience, specializing in contemporary Zen painting. 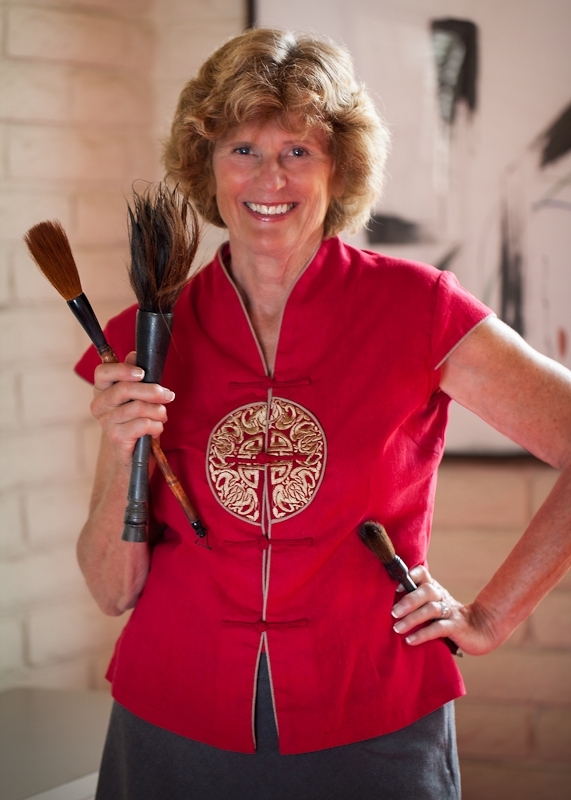 Her artistic career began in 1971 when she was studying Zen and attended meditation sessions at the Tassajara Zen Mountain Center in the central coastal mountains of California. KimBal is influential in national and international circles that celebrate the ancient art of Zen painting. Using a free and spontaneous technique, her painting styles range from the traditional to the abstract. KimBal has illustrated twelve published books. Her art also includes works on rice paper, canvas, fabric, scrolls, note cards, clay ,ceramic tile, film and theatrical scenic design. Watching her work, one realizes that the preparation of the artist’s materials is a mindful process, a form of meditation. She selects the correct brush for the image in mind, dips into her ink and in flashing strokes, the subject blooms upon the surface. Her “dancing brush” has caught the essence of her subject. KimBal is influential in national and international circles that celebrate the ancient art of Zen painting. Using a free and spontaneous technique, her painting styles range from the traditional to the abstract. KimBal has illustrated ten published books. Her art also includes works on rice paper, canvas, fabric, scrolls, note cards, clay, ceramic tile, film and theatrical scenic design. Rosemary KimBal’s work has been shown in galleries and lobbies throughout the United States, Canada, and Taiwan. She represented “Zen Painting in America” at the Ronin Gallery in New York City in 1999. KimBal was selected by General Electric to teach the Creativity Workshop at the Fortune Most Powerful Women’s Summit held in 2005, again for General Electric in Ossining, New York for General Electric in 2006. Rosemary lives with her husband, Raymond Elstad, who is a photographer, in Cardiff by the Sea, California. "It takes courage to come to the hospital. It takes courage and confidence to work here. 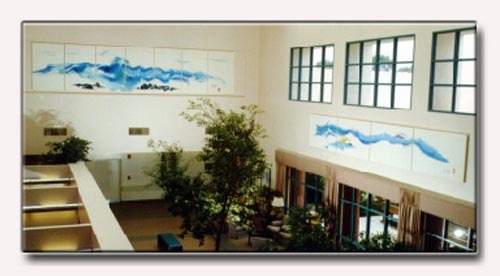 It takes courage to decide to heal" Cardiff By the Sea artist Rosemary KimBal told the audience at the recent dedication of her murals in Scripps Memorial Hospital- Encinitas. " and yes, it did take courage to face 26 feet of canvas to make that first stroke." The murals, suitably named "Courage" (6'x26') and "Confidence" (4'X24') are remarkable, not only for their beauty, but for the translation of the delicate "Sumi-e" style of oriental ink and brush painting, usually found on rice paper or silk, to bright acrylic pigments on canvas. Because of their size and the fact that the actual application of paint took only a few minutes, those who understand the technique realize that KimBal has broken an artistic barrier. Please, inquire about any painting you like. Rosemary is also open for commissions. "Thank you for your creative addition to our group. Keep in touch. I hope to have some more artistic business for you in the future"
Dancing Brush® is a trademark registered by Rosemary KimBal.